After four back to back defeats, Royal Challengers Bangalore (RCB), in search of their season’s first win host Kolkata Knight Riders (KKR) at the M Chinnaswamy Stadium in Bengaluru. The RCB vs KKR IPL 2019 match will take place at 8:00 PM IST. While Royal Challengers are yet to open their account, Knight Riders will be eyeing their third win. Meanwhile, check out the weather and pitch report for tonight’s encounter between RCB and KKR. Royal Challengers Bangalore vs Kolkata Knight Riders Live Cricket Score. As per accuweather.com, the temperature in Bengaluru will go up to 35 degrees today. However, during the match time, the temperature will be between 26 to 30 degrees. Importantly, there is no chance of rain in Bengaluru tonight. RCB vs KKR Head-to-Head Record: Ahead of IPL 2019 Clash, Here Are Match Results of Last 5 Royal Challengers Bangalore vs Kolkata Knight Riders Encounters! 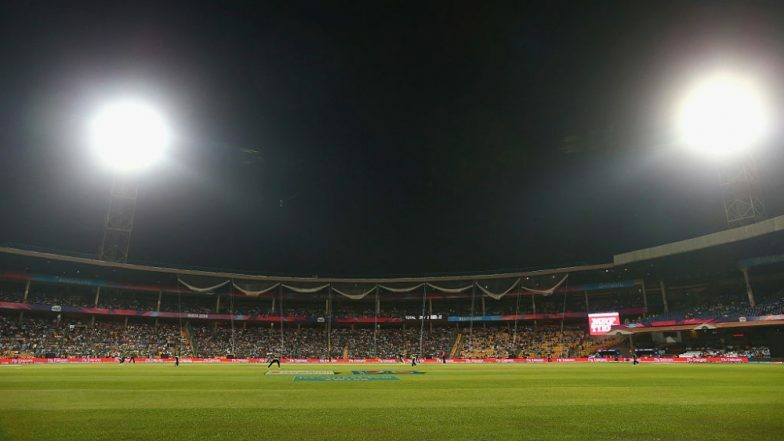 Pitch Report: M Chinnaswamy Stadium is known as batting paradise and is usually full of runs. It is expected to provide run feat once again. However, on the eve of the match, some grass was spotted on the pitch, which could well be trimmed before the start. In the only game at the venue this season, Mumbai Indians scored 187 in the first innings. RCB lost the match by six runs. Kolkata Knight Riders Squad: Nikhil Naik, Chris Lynn, Robin Uthappa, Nitish Rana, Dinesh Karthik(w/c), Shubman Gill, Andre Russell, Piyush Chawla, Kuldeep Yadav, Lockie Ferguson, Prasidh Krishna, Rinku Singh, Joe Denly, Shrikant Mundhe, Carlos Brathwaite, Sunil Narine, Sandeep Warrier, Harry Gurney, Yarra Prithviraj, KC Cariappa. RCB vs KKR, IPL 2019 Match 17, Key Players: Virat Kohli to Andre Russell to Marcus Stoinis, These Cricketers Are to Watch Out for at M Chinnaswamy. Royal Challengers Bangalore Squad: Virat Kohli(c), Parthiv Patel, AB de Villiers, Shimron Hetmyer, Marcus Stoinis, Moeen Ali, Akshdeep Nath(w), Umesh Yadav, Navdeep Saini, Yuzvendra Chahal, Mohammed Siraj, Devdutt Padikkal, Heinrich Klaasen, Himmat Singh, Colin de Grandhomme, Pawan Negi, Washington Sundar, Shivam Dube, Milind Kumar, Gurkeerat Singh Mann, Prayas Barman, Kulwant Khejroliya, Tim Southee, Nathan Coulter-Nile.